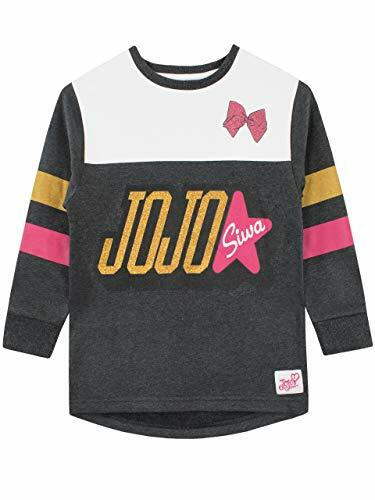 Girls JoJo Siwa sweater dress. Your Dance Moms fanatic can sing, dance and twirl their way to a fabulous day in this glamorous Jo Jo long length sweatshirt! Featuring JoJo Siwa's logo in embroidery and her name and side stripes to the sleeve in bold gold glitter, with her iconic bow in pink glitter just above, this is the perfect dress for fans! Officially licensed JoJo Siwa merchandise, exclusively designed for Character USA. If you have any questions about this product by JoJo Siwa, contact us by completing and submitting the form below. If you are looking for a specif part number, please include it with your message.